I know, I know, this is a Lambretta blog, but sometimes you just can’t ignore what the ‘old enemy’ are up to. And there’s no arguing with the success of a company that have sold over 17 million scooters in their 65 year history. And at their best, I’ll make no apologies for saying they’ve made a couple of the best looking scooters ever. Even the most ardent Lambrettista would find it hard to pick fault with the beautiful organic lines of a GS 160. 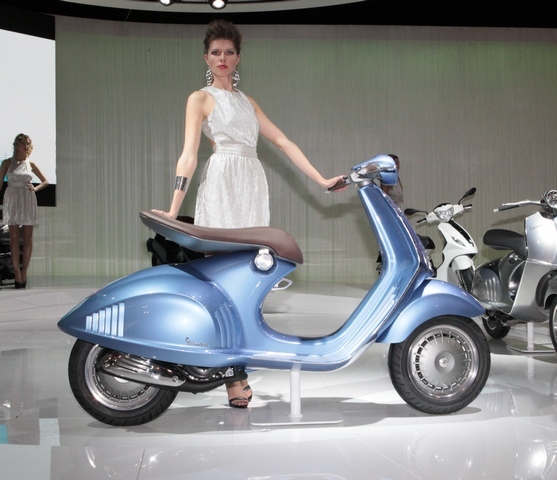 Well, I think there’s another classic in the pipeline, in the shape of this lovely “Vespa 46” or (and it sounds SO much better in Italian) The Quarantasei has been unveiled at the EICMA Motorcycle Show in Milan, and is due to be on sale in 125 and 150cc versions before the end of 2012. This entry was posted in News, Not a Lambretta, Scooters and tagged EICMA, Prototype, Show, Vespa, Vespa 46, Vespa bashing by crocodilejock. Bookmark the permalink.